Marvel’s resurrection of the Amazing Spider-Man franchise this month was marketed to fans as the “return” of Peter Parker, one year after he was ingloriously killed off by Doctor Octopus in ASM #700. Leading off a month of “point one” issues – arguably Marvel’s most confounding numbering gimmick – is the first of a two-part story dubbed “Spider-Man: Frost,” scripted by David Morrell (of First Blood fame), with art by industry superstar Klaus Janson. “Frost” is unquestionably one of the most tender and quiet Spider-Man comics I’ve read in a very long time. It’s the kind of contemplative and cerebral story that’s right in my wheelhouse. Unfortunately, after reading some early reviews of the issue, I’m now wondering if Marvel’s somewhat bizarre promotion of these point one issues has skewed expectations of fans who were anticipating a legitimate “return” of the Parker status quo, rather than a brief “flashback” that actually reads more like an original graphic novel or one-shot issue disconnected from all continuity. If that’s the case, Marvel has not only performed a disservice to its fanbase, but also to this beautifully crafted story by Morrell and Janson. 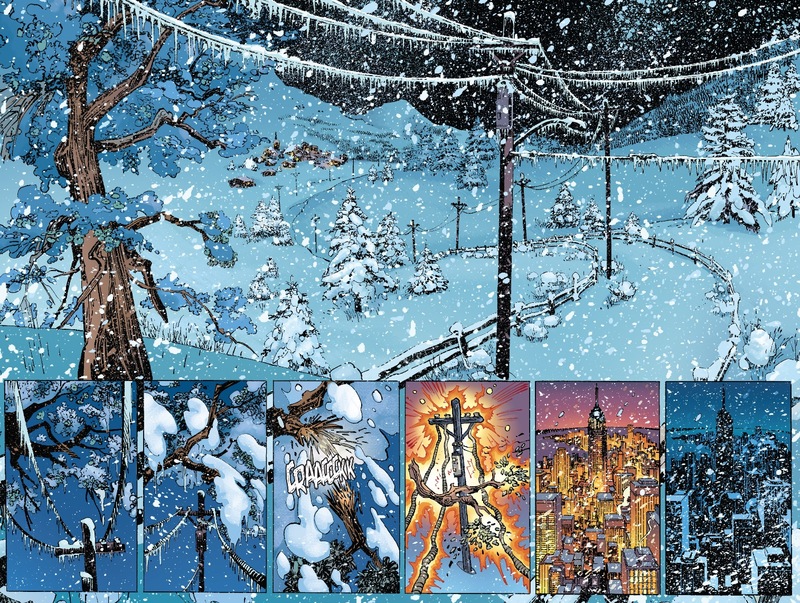 The first-part of “Frost” reads so differently from all of the other Spider-Man comic books currently being published (and it was one of four to be released this week, so I have plenty to compare it with) and with good reason. During my podcast’s interview with Morrell, the veteran novelist and Hollywood writer talked about how he scripted “Frost” as if it were a screenplay. 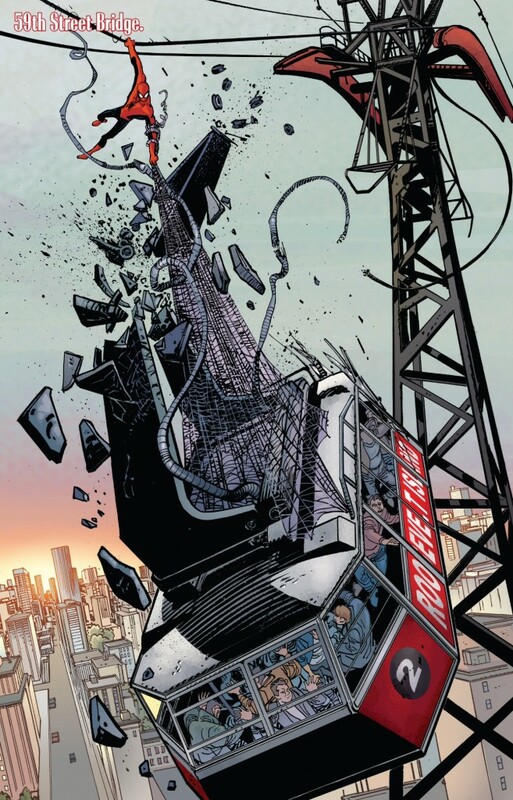 Morrell, whose only previous comic book writing experience is 2007’s Captain America: The Chosen mini-series, admitted that he didn’t comb over issue after issue of Spider-Man comics to mine inspiration for “Frost.” Instead, he chose to build his entire story around Spider-Man’s famous mantra, “with great power, must also come responsibility,” along with Peter’s mother/son dynamic with Aunt May, thereby not giving the “Frost” story a concrete time and place. It’s a far cry from the wildly operatic orations of current Superior Spider-Man writer Dan Slott, who is so versed in Spidey continuity and history, he could probably tell you without breaking a sweat what color underwear Peter was wearing in Marvel Team-Up #83, and how his choice of boxers over briefs somehow played a role in his battle with the Spot in Spectacular Spider-Man #100. As a result, I imagine Morrell’s approach to “Frost” is going to drive a certain segment of the fanbase batty, as they obsess over (what I consider to be) unimportant questions like, “where does this story fit in?,” as if it actually matters whether or not ASM #700.1 takes place before or after “Brand New Day,” in the Bronze Age or Silver Age. Here’s what we know – Uncle Ben is dead, Peter and Aunt May are single and J. Jonah Jameson is the editor-in-chief of the Daily Bugle. That gives us close to 40 years of Spider-Man stories to consider where “Frost” fits in. Looking past the minutia, the first part of “Frost” presents us with one of the most beautifully written Spider-Man scripts since J.M. DeMatteis’ epic ASM #400. Yes, there’s no witty Spidey banter and the story’s conflict is of the internal man vs. himself variety, rather than Spider-Man vs. random bad guy of the month, but Morrell’s prose is rich and Janson’s artwork provides the comic with an almost haunting aesthetic. You want bad guys? Go read Matt Kindt and Marco Rudy’s Marvel Knights mini where Spidey is fighting 99 of them. Keep reading Superior where Spider Ock is taking on villains new and old every issue. ASM #700.1 is the antithesis of a page turner. Instead, Morrell and Janson invite us to linger in their story. There are so many little nuanced scenes that made me stop, reflect and reread. And I expect that the slow, measured pace of the story is by design. Given that the plot of “Frost” is that Peter finds the weight of constantly being Spider-Man slowing him down to the point that his body gives out and can do nothing but sleep as a major blizzard hits New York City, Morrell and Janson’s measured pace is appropriate. 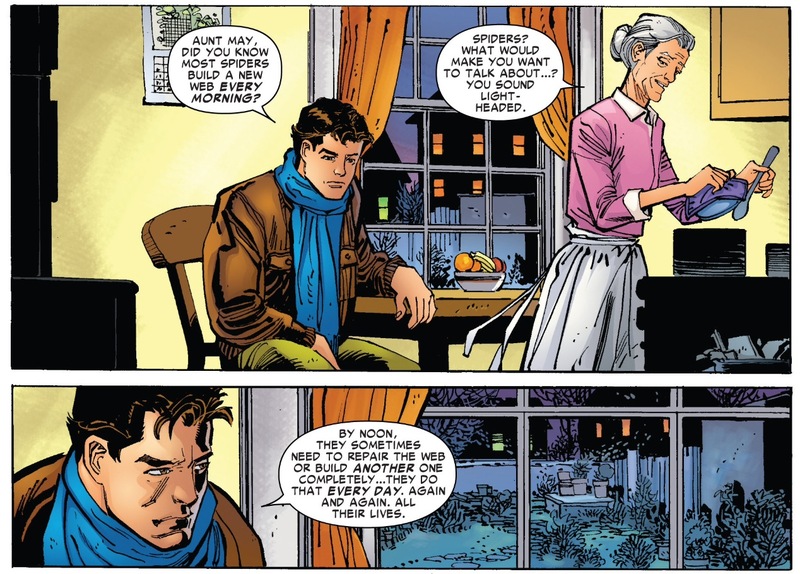 Peter’s speech to Aunt May about a spider’s daily task of building a web, only to see it get destroyed by day’s end (a section of the comic’s narration we were fortunate enough to have Morrell read on Superior Spider-Talk) echoes the heart and soul of what it means to be Spider-Man. I think as readers, we take for granted that for 50+ years (and running), Spider-Man stories have been pumped out in serial fashion. Every time we crack open a new Spider-Man comic, there’s always a new threat, a new problem, a new burden weighing on Peter’s shoulders. 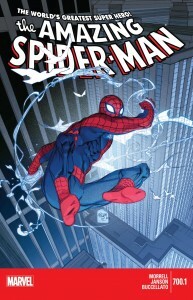 In the current Superior status quo, the entire thesis of that series is built around this idea of a “new” Spider-Man attempting to prove himself as Peter’s “superior.” Even in death, Peter is burdened … and then one or two weeks later, Slott or Christos Gage, or whoever else is writing a Spider-Man story, breaks down the web and forces the character to build a new one. It’s a surprisingly fresh take on the classic “Spider-Man: No More” premise that has been written about countless times before by other creators. I don’t get the sense that Morrell’s Peter wants to quit being Spider-Man, but he’s aware of his emotional and mental limitations, leading him to question whether he can continue as Spider-Man (regardless of want or need). This idea is further accentuated by Janson’s illustration of Peter’s costume crumpled up on the floor of the shower (rather than dramatically thrown away in a garbage can like in John Romita Sr.’s iconic image). And yet, regardless of whether or not he is truly physically and mentally capable of continuing on as Spider-Man, by issue’s end, Peter is presented with a situation where he MUST soldier on. The blizzard of the century has trapped everyone indoors. There’s no power or heat and a tree limb has just smashed through Aunt May’s window. Peter’s Spider Sense indicates that something is wrong with May (which may be a bit of a stretch in terms of what his Spider Sense is capable of picking up, but it ties so neatly into the issue’s climax that I’m happy to look past it). As Peter, he can do nothing to save Aunt May, but as Spider-Man, there’s a chance. And that’s your set-up for part two (which is the final part of this arc. Yet another flaw in Marvel’s marketing was the vagueness of the solicitations making it sound like these five point ones ALL tied into each other. That’s not the case). 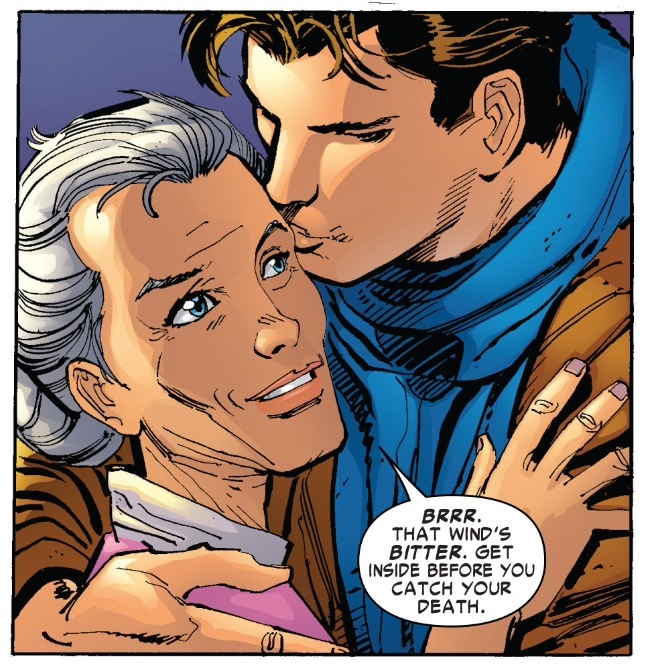 The drama of this comic’s final few pages is set-up earlier by Morrell and Janson’s utterly heart-string-tugging interpretation of the Peter/Aunt May dynamic. This relationship hasn’t been written and illustrated with such tenderness and emotional heft in years. One of the many powerful images in this book is Peter clutching May, resting his head on her like a small child would with his mother. On the very next page, Janson draws the same image, except this time the lights inside May’s house are on and it’s evening outside – indicating a lengthy passage of time where Peter just sat there, resting and seeking maternal nurturing. Again, I can’t help but look at these images and not think back to “second to the right and straight on ‘till morning” in ASM #400. That was probably the last time I was this moved by a Peter and May scene (though J. Michael Strazynski’s “The Conversation” is up there as well). I can’t imagine what Marvel was thinking in promoting this comic as some kind of “triumphant” return of Peter Parker (not to mention pairing it with other point ones that look to be a mish-mash of anthology-type short stories that traditionally appear in annual issues). 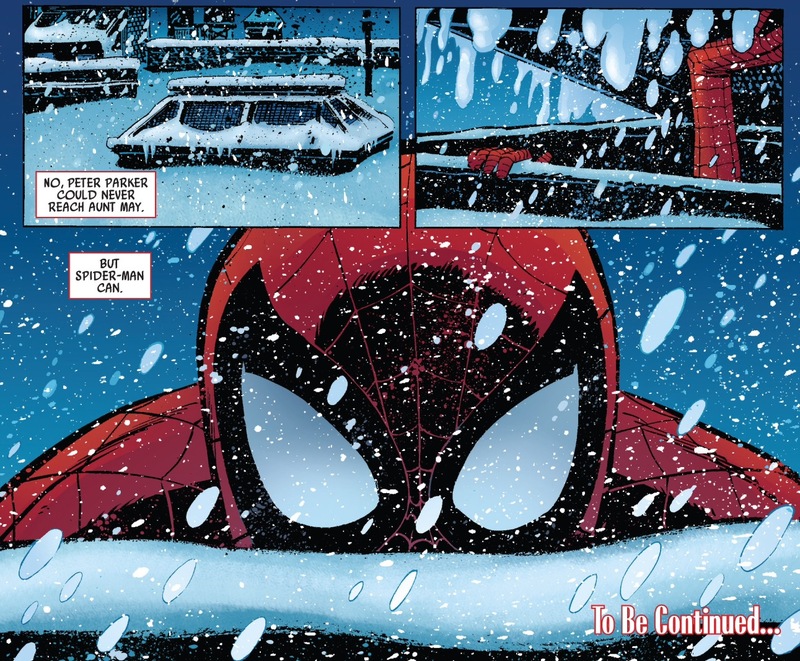 I hope other Spider-Man fans and readers are giving “Frost” the chance it deserves to emotionally make its mark. I haven’t even read the second half of the story yet, and still there’s a haunting quality to it that I can only compare to how I felt the first time after seeing a movie like Saving Private Ryan, or Breaking Bad’s “Ozymandias.” It saddens me that Marvel’s editorial team would resort to its usual bombast and hyperbole to misleadingly hype a story that clearly deserves a more meticulous approach. Yeah I completely agree with your review. 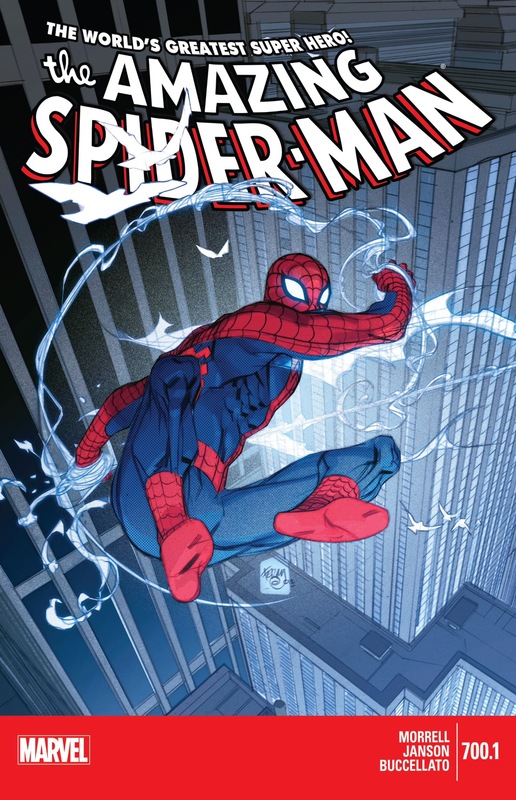 I really enjoyed this issue, I loved the tone and weight placed on the task of being Spider-Man. I tend to want to move away from stories that are trying to force a more “grown-up” or “gritty” narrative, but this felt so in-keeping with Spider-Man’s core ethos that I felt it really nailed the sacrificial nature of Peter Parker and the struggle that has placed on himself. I’ve read some reviews of this criticizing it for using the tried and tested trope of Aunt May needing saving, but this felt like way more then the usual damsel in distress malarkey. This was a perfect illustration of Peter’s motivations distilled into a lovingly written story. He’s a great character not because he’s the under dog and not because he’s a geek or even because he always saves the day: He’s a great character because, unlike most super-heroes who are the product of actions outside of their control, he’s entirely driven by the mistakes he’s made which is something everyone can relate to. I totally agree with your views on this issue. I think what appealed to me was the slower paced, more thoughtful narrative of it all. Paul Jenkins run on Peter Parker: Spider-Man is one of my all-time favorites because his main focus was on providing an introspective look at the character and his world. I think he’s said before that he was concerned on presenting a distillation of the character at his core. David Morrell sounded like he had the same approach in mind in the interview you did on Superior Spider-Talk. I think Slott really gets Spidey as well but his focus is on the grander scale, as you’ve noted. Slott’s style is very jam packed and full of quick beats – that’s fun but this is a nice change of pace. I suppose it speaks to my love for those grounded, character orientated books with my favorite currently being Superior Foes of Spider-Man. These are just the kind of books that stick with me more and give me more attachment to.